The Capricorn and Sagittarius in love in a romantic relationship might start slow. They will feel like they do not have a lot to learn from each other. They can have very opposite natures. The Capricorn zodiac sign is focused on details and passive. They might be somewhat timid. They will always be looking for their next big project. The Sagittarius star sign is laid back, whimsical, and looks for knowledge for its own sake. They will jump into new things and will lack patience. Their differences can build a stronger bond the longer they are together. The Capricorn Sagittarius compatibility will have a lot that they can learn from each other. Capricorn is an Earth sign. They will take a more rational, factual view. The goat will think about the consequences of their activities. Sagittarius is a Fire sign. They will take the time to evaluate things philosophically before they start a new project. The archer will want to explore for their own personal contentment. They will have different morals. Because of this, the Capricorn dating Sagittarius might fight. They will both need to agree to overlook each other’s differences. The Capricorn Sagittarius relationship can be good because of their natures being well rounded and complementary. Capricorn is a Cardinal sign. They will be the one to not just have new ideas but will assign roles to other people. They can easily work to accomplish their comparable goals. They will not fight over roles on a project. Sagittarius is a Mutable sign. They might not be a leader or motivate other people. If they have a good idea and see a way to contribute to the project, they will be more than happy to. The best thing about the Capricorn and Sagittarius love compatibility in a romantic relationship is how they can work together. They will both need to be able to overcome the initial resistance they might feel to each other. The goat and the archer will find that they have a lot to learn from each other. They both have very different personalities. However, the Capricorn Sagittarius in love will have a very effective romantic relationship. The Capricorn personality is solemn, serious, and responsible. However, Sagittarius will be careless, unconventional, and somewhat irresponsible. They can make a quirky and unique but successful relationship. The goat and the archer have a horoscope compatibility that could be more successful than some more obvious relationships of the zodiac. Capricorn and Sagittarius compatibility will not seem successful on the surface. Their ruling planets will work against each other. Saturn rules over Capricorn zodiac sign. This is the planet of restriction, responsibility and duty. It will be the adult influence in the relationship. Jupiter rules over Sagittarius sun sign. It will be the planet of bounty, joy, happy, and generous feelings. Because of this, Sagittarians will have a free spirit. The goat and the archer will be more compatible in love than just on the surface. They will both have different views on life. However, they can give each other what they need most in life. When Capricorn and Sagittarius fall in love, they will find it is easy to hold each other’s interest. The goat is attracted to the archer’s fire and lively nature. However, they might not want to admit it. The archer will admire the goat’s wisdom and steady nature. Capricorn is an earth sign and Sagittarius is a fire sign. The archer will give the Capricorn Sagittarius marriage passion. The goat will give the relationship an earthy seduction. When they develop a sexual relationship, they will both be very attracted to each other. Capricorn and Sagittarius in bed will be surprised to be compatible. However, it will be a good one. Capricorn dating Sagittarius will both be on a kind of quest. They will both see this in each other. Sagittarius the adventurer will have a more obvious quest. The archer will be continually looking for knowledge and new horizons. Capricorn will be on a quest to their chosen ambitions. They will give a lot of motivation to accomplish their goals. 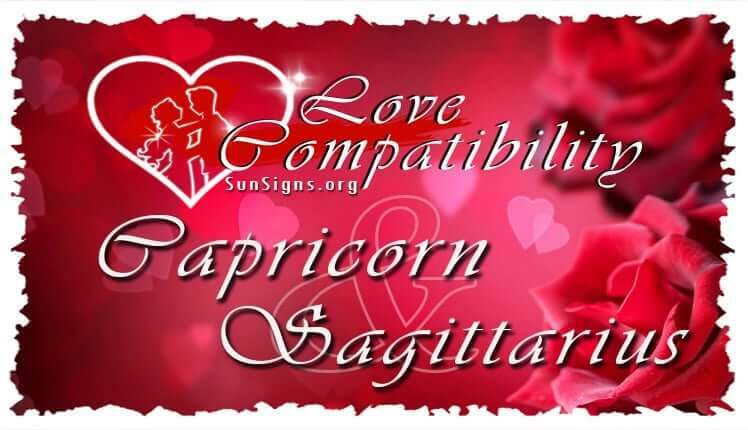 The Sagittarius man or Sagittarius woman will depend on the Capricorn born the longer they are together. The archer will need the goat for their proven method of problem solving and accomplishing goals. Capricorn will appreciate Sagittarius’ spontaneity the longer they are together. The goat might learn to relax a little from the archer. Capricorn and Sagittarius soul mates might not be able to see past each other’s negative traits when the relationship is established. Sagittarius can seem wild. Capricorn can seem pretentious and elitist. They will both need to not focus on each other’s negative traits. They will both need to look at each other’s strengths. If they can do this, they will see there are a lot of attractive zodiac personality traits about each other. Sagittarius can give the goat adventure and excitement. They can show them a view of independence that Capricorn is usually missing. Capricorn will teach the archer how to be detail oriented. Sagittarius born will learn that the little things in life are important. They will be able to teach them how to focus their random energy. The archer might think the goat is too responsible. They will show them how to relax a little. The goat might think the archer is too careless and impulsive. They will be able to show them how to be more well mannered. The Capricorn Sagittarius friendship will not be completely smooth. They might have a fight of convention versus rebellion. They might fight over family finances. The archer does not like convention. They will want to do things differently because they can. The goat is steady and traditional and will be disturbed by this. The Capricorn male or Capricorn female will spend a lot of time securing finances. Sagittarius will be likely to spend it carelessly. If they have fights they will need to discuss them. This might lead to a Capricorn Sagittarius breakup. Capricorn is the mythological sage of the zodiac. Sagittarius is the mythological adventurer of the zodiac. The adventurer will need advice and assistance from the sage. The sage will want a young adventurer to guide and shape. They can easily help each other with their life purposes. However, they have to be careful not to dismiss each other too early. Capricorn and Sagittarius in love might find it hard to establish a relationship. Capricorn will be pretentious and will not like Sagittarius’ behavior. The archer will think the goat is boring. The planet Saturn rules over Capricorn and the planet Jupiter rules over Sagittarius. Saturn will be about hard work, diligence, motivation, and responsibility. Jupiter will be about learning, philosophy, expansion of knowledge and good luck. However, the traits of Jupiter might lead to excess. They will both affect each other in a positive way. They will both bring out each other’s more positive traits. The goat and the archer both will need to step back and be sure to appreciate each other’s different views. Sagittarius can teach Capricorn to be more spontaneous. Capricorn is rational and can teach the archer to be more stable. Capricorn the sage and Sagittarius the adventurer will be able to take on the world. However, they will both have to have patience. They will both have to make an effort with this Capricorn Sagittarius relationship. They will both have to agree to work together. If they can do this, they can easily have a happy relationship together. They can have a successful relationship if they both want to work on it.